One mile north of Millfield school and about a quarter of a mile before you get to Thornton windmill on the Fleetwood road at Four Lane Ends lies the war memorial in Thornton.The roads go to Cleveleys proper on the sea front, Thornton inland. Poulton/Blackpool and Fleetwood. There was a National Westminster bank on one of the corners, a library/theatre on the opposite side. It is a busy road! As you can see the memorial gardens are very well kept and although traffic literally pours round it - seems very quiet, maybe the trees help. The memorial was officially unveiled by Colonel Sir Hugh Jeudwine on the 11th of November 1923 - the fifth anniversary of the Armistice. There is a link here for supplementary information. looking in the general direction of Thornton. To the left lies Fleetwood and to the right Poulton. At our backs is the road to Cleveleys. 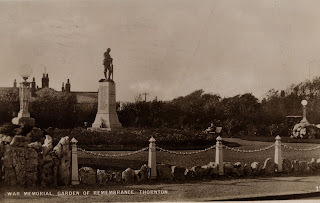 This is the memorial in 1935, posted from Blackpool. The real photographic postcard is by M. Miller and Co, Blackpool. Seems rather poorly composed, certainly never seen this shot before. The memorial is almost in two halves. There is a slab to the right of the picture that has been placed by ICI, relating to the fallen employees of the plant for both World Wars. This slab was moved here at the closure and demolition of the Burn Naze plant. The central memorial relates to the fallen from the Great War and the three open books commemorate the fallen from World War 2. It is indeed a heavy toll for what would have been a small village, it still is. I suspect some of the names on the ICI memorial will match the main memorial and possibly the open books too. The names on the memorial have been added to the Datastore here. Here is a link to the Millfield School Roll of Honour. They also have some of the same names. This is quite a large memorial. Approx. 6 feet in length. There does seem to some wear on it. The letters are clearly discernible but the debris from the trees does cover it. Really glad that ICI or whoever decided to move it from the Burn Haze works before it was flattened. It's clear that this piece of stone has been added to the bottom of the existing memorial. I have to admit that the actual books "work" very well. There must have been the temptation to add them to the main memorial. Thank you very much for your comments. I was fortunate to go to the unveiling at Millfield School. It was when the school was shutting for the day - pupils were leaving. Quite surreal really. 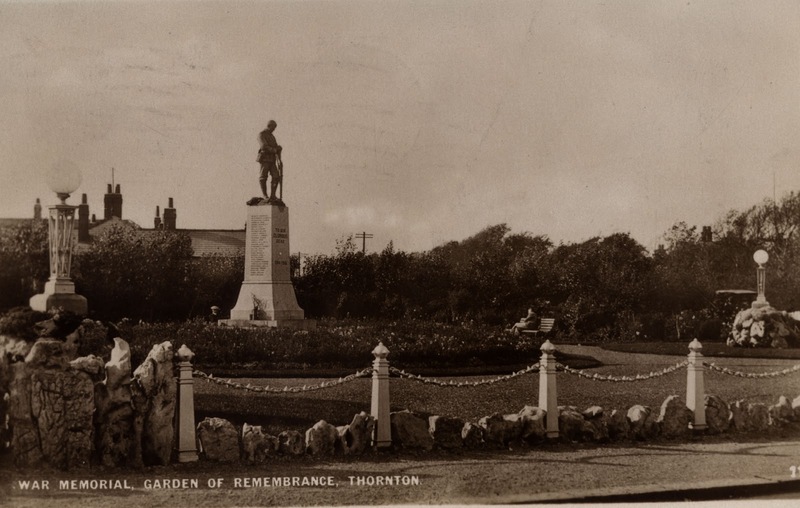 There is a clear link from Millfield to the Thornton Memorial. I feel that my role is to photograph the memorials and list the names. It is a starting point for researchers. 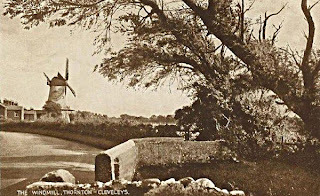 Hi, That picture of Thornton windmill is taken from the corner of Fleetwood Road where the junction with Church Road is now. The wall is actual part of the farm house that used to stand where the bungalows on Church Road and Waring Drive are.